The winter months are a big time of year for home remodeling shows. During these cold months, it is great to escape out of the cold and get tips and ideas for spring and summer home remodeling and renovation projects. Before you know it, spring will be here and you will need to really start planning your organization and remodeling projects. 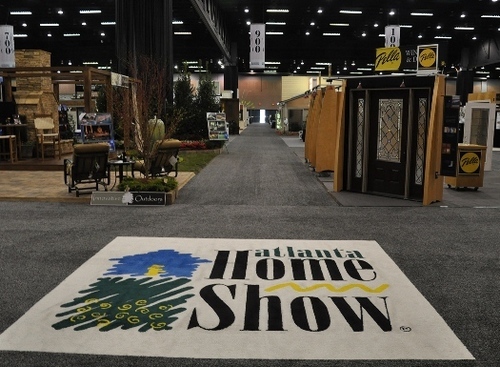 There are three big home and remodeling shows in the Atlanta area over the new few months. The first is this weekend, January 24th to 26th, at the Atlanta Exposition Center (North Building). The 15th Annual Atlanta Build, Remodel and Landscape Expo has exhibits, seminars and demonstrations on the latest in home design, remodeling and renovation. The show features thousands of ways to be smart and cost-effective when you are taking on a big home project. The exhibits contain the latest information on kitchen cabinets and countertops, flooring, sunroom and additions, basement waterproofing, energy-efficient windows and much more. There are daily seminars taught by the experts throughout the 3 day event. One of the special events of the show is the Atlanta Designer’s Network “Designer Matchmaker” program. You can be paired with a local designer for a 15-30 minute free consultation to get advice and design ideas for home. It is encouraged to bring your design ideas and plans with your to the consultations. The second show of the season, the 17th Annual North Atlanta Home Show, is February 21st to 23rd at the Gwinnett Center. This show features more than 150 companies showcasing the latest in home improvement products and services. Tonya M. Williams, home décor expert from HGTV, will be sharing bathroom beautification tips. There will also be seminars and demonstrations throughout the show. There is also a special free trade day on February 21st, where members of the housing and building trades will get free admission to the show. The last show of the season is the 36th Annual Spring Atlanta Home Show at the Cobb Center from March 21st to 23rd. Ahmed Hasson, from the DIY Network, will be one of the professionals sharing the latest in home renovation and design tips. They are still developing the schedule for the show, but you can find out some of the seminars on the website. The show also features a “See-Thru House”, which is a one-of-a-kind exhibit that shows you how a house is built and what goes on behind the walls of a home. There will also be a special exhibit on universal design, which is one of the hottest trends in home design and remodeling. Once you have attended the shows and spoken with the experts about your spring and summer renovation project ideas, then it is time to start planning all that you will need to do for your project, such as deciding to hire a contractor and buying the supplies. When you are ready to start the project, it is important to completely clear the room that you are working on of furniture, knickknacks and other items to protect them from damage during the remodeling process. Renting a self storage unit or mobile storage container are great options for storing items during renovations projects. Storage World and Storage World on Wheels has 3 locations in the Atlanta area in Decatur, Jonesboro and Stockbridge to help with your storage needs. A mobile storage container can be delivered to your home and kept there during the remodeling project or can be stored at one of Storage World’s 3 locations. All facilities offer month-to-month rentals, which is perfect for short-term needs. Storage World also has a wide variety of moving and packing supplies so you can box up and protect your furniture and personal items during your home project. Stop by our locations to see how Storage World can help you with storage solutions during your spring and summer home improvement projects!